If you are looking for a long black leather belt to compliment your new look, whether it is gothic, medieval, or totally unique, then you have found it in the Saxon Black Buckle Belt. This belt is made from 100% leather and fits well into most styles. This black belt is a bit thinner and longer than most, adding to its unique design. 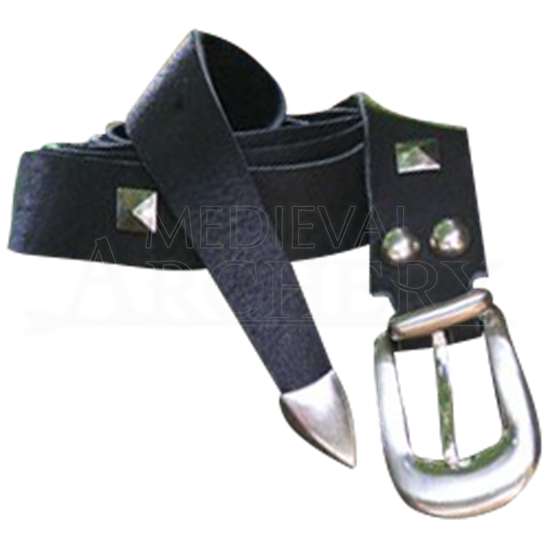 It will always measure approximately 65 inches along, and changes in size simply change where the holes are to accommodate the buckles prong. This belt has simple and elegant silver-metal hardware. The tip of the belt is encased in silver-metal while the belt itself features square, pyramidal studs along its length. A pair of round studs decorates the end, just near the silver-metal buckle. This belt only comes in black, but comes in four different sizes. Order according to your waist size in order to get the best possible fitting belt. The extra length of the belt is yours, to do what you wish with it. It can be wrapped around and fastened to create a double-layered belt or it can be tied and folded, to give the appearance of a medieval-styled ring belt. Whatever you do with it, the long Saxon Black Buckle Belt is a sleek and stylish belt to add to your wardrobe, one you can use with modern clothing to create a subtly dark and gothic style or mix and match with your medieval looks to your hearts content.